If you are suffering from extreme farsightedness or presbyopia (age-related farsightedness), refractive lens exchange (RLE) is an effective treatment that can improve vision through the use of an intraocular lens (IOL). LASIK and other laser vision correction procedures are generally ineffective in correcting these conditions, especially presbyopia. Patients who do not want to rely on reading glasses may undergo RLE to improve their vision and reduce dependency on glasses. Dr. Sonny Goel can perform refractive lens exchange at his Baltimore, MD-area office to restore your vision. Refractive lens exchange is quite similar to cataract surgery. The only difference is that the lens removed from the eye in RLE is clear rather than clouded. 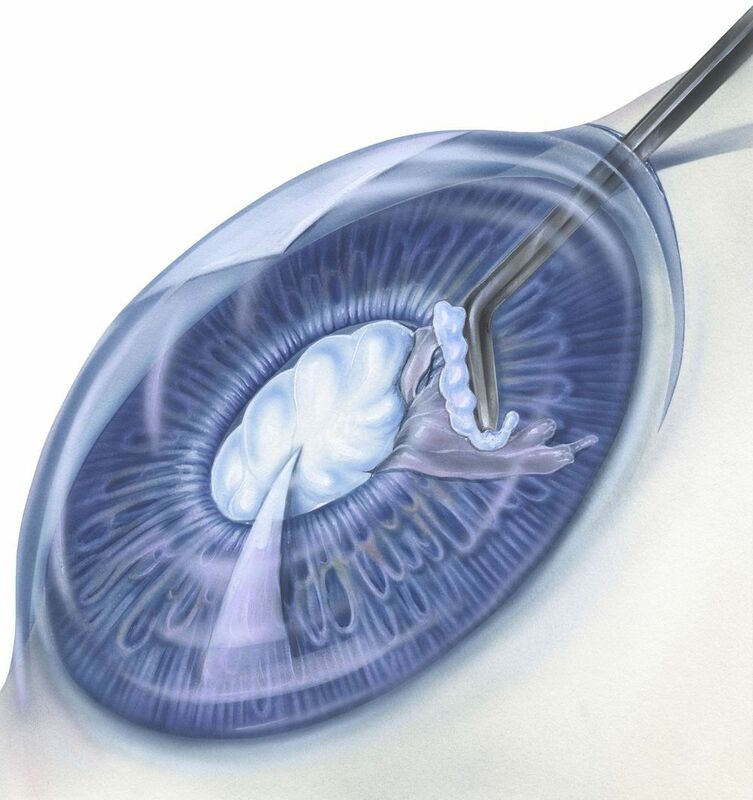 The procedure removes the natural lens of the eye, replacing it with an IOL. The IOL corrects the refractive error to give you greater focus and reduce your need for reading glasses or bifocals. Patients who do not want to rely on reading glasses may undergo RLE to improve their vision and reduce dependency on glasses. How is RLE Different from LASIK, PRK, and LASEK? LASIK, PRK, and LASEK all use a laser to reshape the corneal tissue to correct vision problems such as nearsightedness, farsightedness, and astigmatism. The corneal tissue is not reshaped during RLE, making it less than ideal for correcting astigmatism. Dr. Goel typically recommends RLE for patients with presbyopia. The procedure is also a suitable option for patients with severe farsightedness, which can preclude patients from LASIK. If a patient is not a good candidate for any laser vision correction procedure, RLE is typically a good alternative to reduce the patient’s dependence on glasses or contacts. Dr. Goel recommends waiting to perform RLE until a patient is at least 21 years of age. Most patients begin experiencing presbyopia in their 40s and 50s. Refractive lens exchange typically takes 15 minutes to complete per eye; however, each eye is typically treated at least a week removed from the other. Prior to surgery, Dr. Goel will place numbing eye drops to minimize your discomfort. To access the lens, he will create small incisions in the cornea. He will break up the lens into smaller pieces using an ultrasound device before suctioning the lens pieces out. He can then insert an IOL in its place. There are different IOLs available, and Dr. Goel can select the type that will best meet your needs. Monofocal IOLs provide clear distance, intermediate, or close-up vision. Multifocal IOLs can provide you with clear vision at multiple distances. Accommodating IOLs are monofocal, but like your natural lens, they can flex to provide vision at multiple distances. Once the IOL is in place, Dr. Goel will place a protective contact lens bandage over the eye. You will need someone to drive you home following your procedure and you will generally need up to a week off work. If you need RLE in both eyes, you will need up to two weeks off work, as the procedures are performed a week apart. You may experience hazy or blurry vision, and final outcomes can take several weeks to become apparent. If you are struggling with extreme farsightedness or presbyopia, contact our ophthalmology office to schedule a consultation with Dr. Goel. He can help determine which intraocular device will benefit you the most and help you minimize your need for corrective eyewear.